The Trapiche deposit, belonging to El Molle Verde S.A.C (100% BVN), a subsidiary of Buenaventura, is an open pit copper project located in the district of Juan Espinoza Medrano, Antabamba province, Apurímac region. 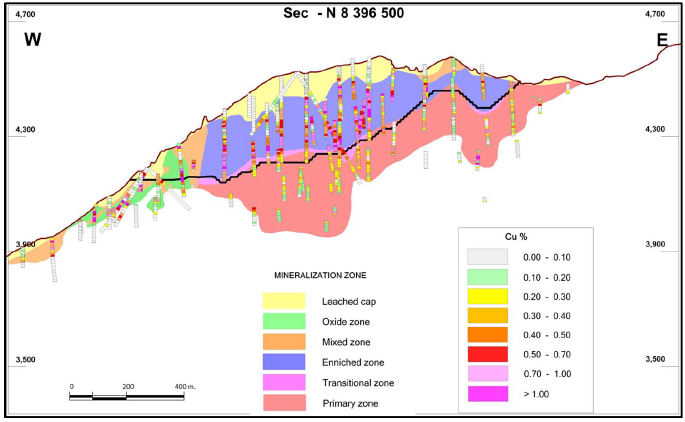 A conceptual project has been developed for the leaching in piles of the secondary enrichment minerals (enriched zone) of the deposit. It is expected to have a prefeasibility study for 2018. This deposit was discovered by Buenaventura in 1993. Geology: Trapiche is a molybdenum copper porphyry of oligacenic age located in the southwest margin of Andahuaylas-Yauri belt. It is composed of three contiguous mineralized zones: porphyry monzonitic quartz, pipe gap and copper in oxides zone. Mineralization in the porphyry and pipe gap sectors present a vertical zoning from the surface where the leached zone is located, then the enriched zone, reaching depth to the transitional zone and then the primary zone. There is little presence of oxides and mixed.